Avocado Oil from New Zealand has a distinctive, fruity flavour that is good for dressings as well as for frying. It is extracted from the first cold pressing of avocados, in the same way as extra virgin oil is pressed from olives. Here it is blended with plenty of fresh basil, garlic and chilli to make a pasta sauce. Place the avocado oil in a blender or food processor with the lime juice, garlic, chilli, three quarters of the basil leaves and seasoning, and blend briefly until the basil is coarsely chopped. Scrape the mixture down from the sides of the bowl if necessary. Bring a large pan of water to the boil, add the pasta and cook for 2-3 minutes until just tender. Drain lightly and return the pasta to the pan. Add the tomatoes, basil mixture and mozzarella to the pasta and toss the ingredients together over a gentle heat for 1-2 minutes, until warmed through and the cheese is melting. 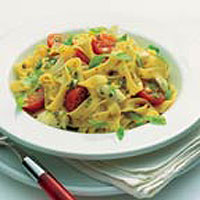 Tear the remaining basil leaves, scatter them over the pasta and serve immediately. Avocado oil is versatile and can be used for marinades, salsa, dressings, for brushing on chicken or fish. Use prepacked Galbani Italian Mozzarella as an alternative to the mozzarella balls in avocado oil from the Deli Counter. The basil mixture can be used instead of milk and butter in mashed potatoes, or added to boiled new potatoes.